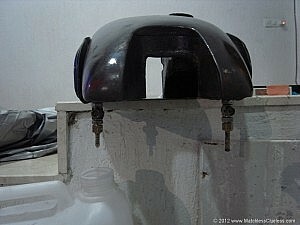 An article describing the black art of trying to stop classic motorcycle petrol taps leaking. 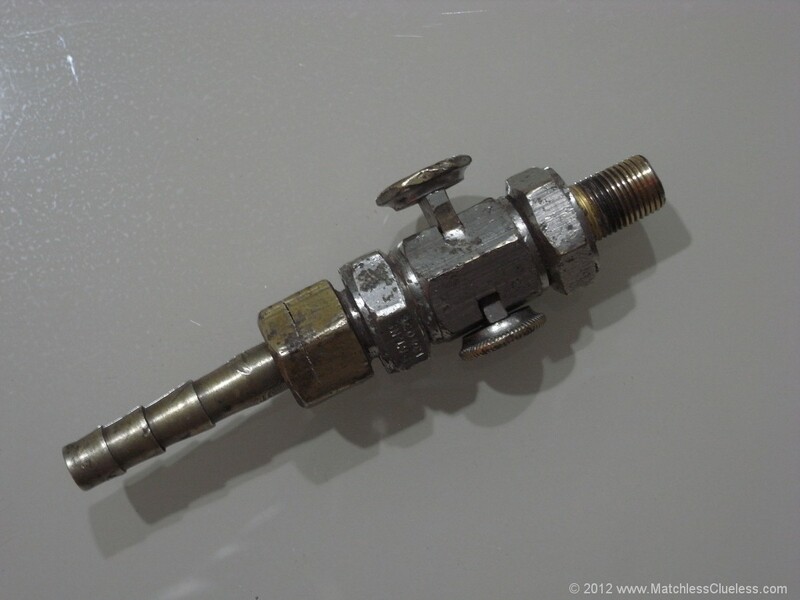 This guide shows you step by step how to fix leaking “push-on push-off” type petrol taps as fitted to my 1951 Matchless G3Ls and countless other bikes of the same era. These taps have a central slider which you push one way with a hexagonal knob to turn the petrol on (remember hexagON – ON) and the other way with a round knob to turn the supply off. The Matchless part number (according to my 1951 spares catalog) is 017050. The internal seals against the on-off slider are made by two thick cork washers, one above and one below the slider. Over time these can easily perish, especially if they have become dry whereby they shrink and hence the seal goes. The petrol taps are reasonably easy to repair though, although they can be fragile and so care is needed with taking apart and fitting back together. As well as seeping from around the on-off slider, there are various other locations from which petrol may leak. It’s probably worth trying to figure out exactly where the problem lies before removing the taps for servicing so that you at least know where to concentrate your efforts. If it turns out that its just the seal between the tap and the tank itself which is leaking, I would personally leave the on-off slider mechanism well alone and only replace the relevant fibre washer. Step 9 – Refit to petrol tank… and fingers crossed! 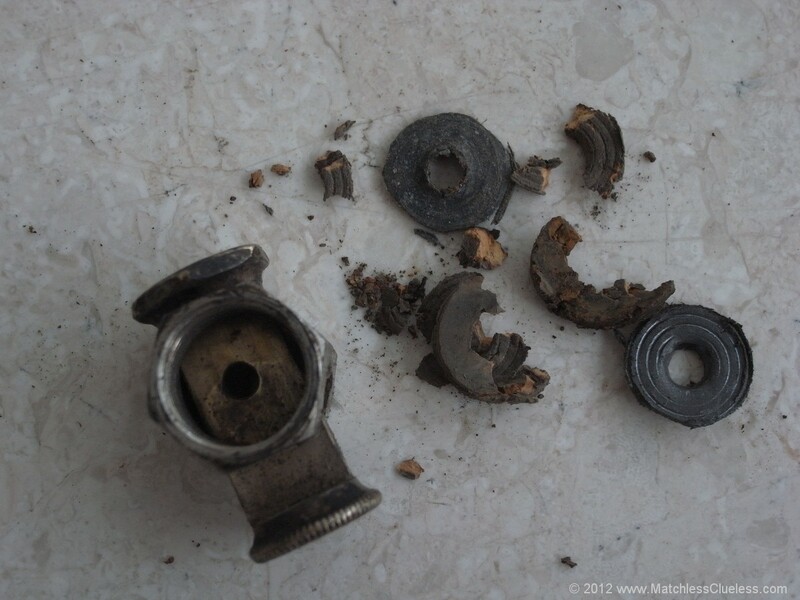 Before you start taking anything apart, it’s worth getting some new seals and washers ready. You are almost certainly going to need both, so you may as well get them ready before you start. I bought a couple of sets of replacement cork seals from AMC Classic Spares for a total of £1.60 for four (remember you need two corks for each tap, one above and one below the slider). They are also available on Paul Goff’s website here, but are a bit more expensive at £1.00 a piece. You will probably also need some new fibre washers which fit between the tap assembly and the tank itself to make sure no petrol leaks out here either. Before fitting the new corks to my taps I did a quick measure up for future reference. Each cork seal was about 6.5mm (1/4 inch) thick. 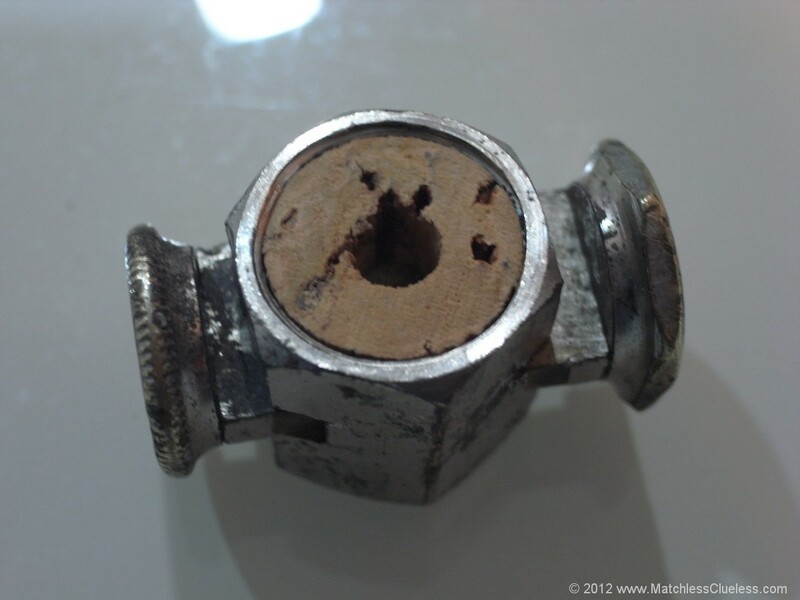 The outside diameter was 13.5mm (1/2 inch) and the diameter of the hole through the middle was around 5mm (1/5 inch). These measurements are with the cork fully dried out, as delivered from AMC Spares. When soaked in petrol they should (hopefully!) swell up making a good seal inside the petrol tap. None of these dimensions are probably too critical so long as they are in the right ball park as the corks will get squashed (expanding the outer diameter and reducing the thickness) when they are installed. Practically speaking though, they need to be a good snug fit into the main body of the tap (but not so tight you damage them putting them in) and thick enough that the start of the internal thread is just visible allowing you to screw the ends of the taps back in. The material they are made from is probably more important. This needs to be a good quality dense cork as you might find in the end of a decent bottle of wine. Plastic ‘corks’ aren’t going to be any good as they won’t swell when in contact with petrol, and the cheap cork used for message boards etc will have too many holes and notches in it. Some people say they make their own washers (this had the advantage that you probably need to sample a few decent bottles of wine first before finding a suitable cork! ), but for me it was just easier to buy some off one of the suppliers mentioned above and save all the messing round trying to cut a piece of cork to the right shape. When you remove the taps for servicing any petrol remaining in the tank is obviously going to end up in a nice puddle on your floor. So you first need to make sure that the tank is fully drained. Do this via both petrol taps to ensure that both sides of the tank (main and reserve) are fully empty. Once my petrol tank was empty, I decided to remove it from the bike in order to clean it inside. Whilst not strictly necessary (you could easily service the taps with the tank still on the bike) it seemed like a good opportunity to get some of the accumulated crud out from inside my tank. I removed one of the two taps, put a finger over the hole and then poured in some petrol. A good shake around to rinse any rust and debris out then finger off the hole and pour the petrol out into a separate container. After repeating a few times (filtering out the bits from the petrol with a strainer each time), most of the accumulated debris had been flushed out. Make sure you don’t use soap and water for this though as this could start rust inside the tank, or problems with running if there is still some water in there when you fill back up with petrol. A final swill round with a mix of petrol and oil will leave a thin waterproof coating inside the tank to help prevent unwanted rust forming. 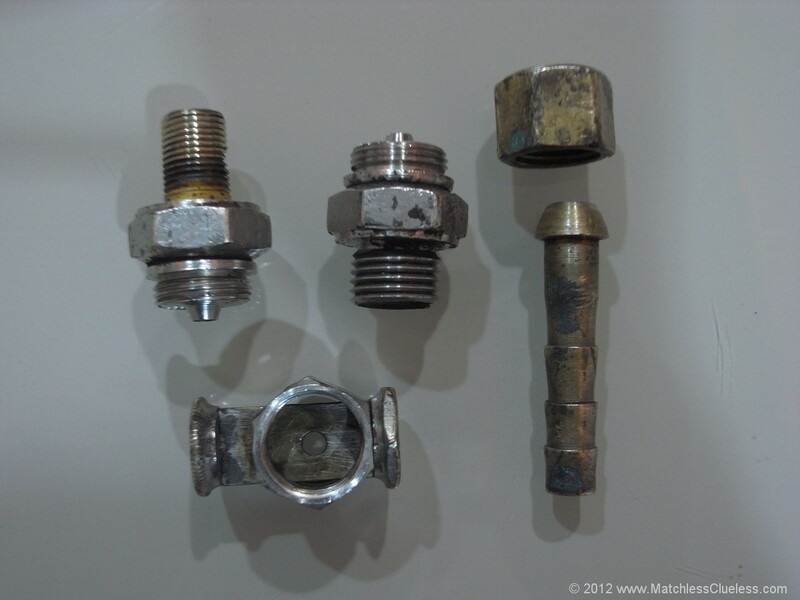 A word of caution – some of the parts of the petrol tank assembly may be fragile and the threads easily damaged, especially if its an original tap and more than half a century old! Take care when removing the taps from the tank and later taking them apart. Make sure you have the correct spanners and/or sockets to fit. My taps needed a combination of 16, 17 and 18mm spanners to take apart (I didn’t have my imperial set to hand, but these metric sizes seemed a good fit anyway). Long reach (deep) sockets may also be useful – I found a small spark plug socket was ideal for putting over the top of the hosetail to loosen its fixing nut. To remove the taps, carefully unscrew the nut at the top of the assembly (i.e. nearest the tank) using a suitable spanner (16 or 18mm in my case). It should hopefully come out fairly easily, unless it has had some sort of glue / sealant applied before. Be prepared for that last trickle of petrol coming out when the tap is removed! Firstly, an important note – you do NOT need to remove the on-off slider assembly from the main body of the tap in order to change the seals. The ends of the central slider are peened-over to hold the two knobs on and they will be difficult to get back on if you do take them off. You will need to separate these five components in order to replace the cork seals inside. I started by putting a spanner / socket on each end (whichever fitted best) and untightening. The losest connection obviously undoes first and you can then work your way along until all parts are separated. A bench vice could also be useful for holding the assembly whilst you take it apart, but I didn’t have one available. If any connections seem very tight, try soaking in WD40 / Plus-gas or the like first, but avoid too much pressure if at all possible as some components / threads may be quite fragile. Take great care when it comes to holding the central slider assembly body of the petrol tap, a slip could easily break off one of the knobs or deform the slider! One tip is to put the slider in the mid-position (half-on half-off) and a thin (or ground-down) socket should then fit over either end. It’s easy to slip with a spanner as you’ll need to put it on at an angle because the slider and knobs will get in the way. All being well you should have been able to separate the petrol tap into its component parts. Looking inside the main slider body, you should see the old cork seals both above and below the on-off slider. They may not look like cork any more though! Flick them out using a small electrical screwdriver or similar – they’ll probably crumble into corky dust rather than come out in one piece, as in the photo below. Just be careful not to scratch the slider mechanism or damage the thread as you do this as it could affect the quality of the seal you get once reassembled. With the old corks out you can then give the various bits a good clean to remove all the grime, both inside and out – a rinse in some petrol is a good starting point. Make sure all of the threads are clean and in good condition and pay special attention to the surfaces of the slider as this is where you need a good seal. How much you clean or polish the outside of the taps is obviously down to the look you want on your bike. For me, a good clean in petrol and then a scrub with soap was enough as my bike looks old and so shiny-new taps would look a bit out of place. But you could get them polished up if you like, just be very careful not to damage the on-off knobs or the slider. Also check the hosetail connector. This has a domed end which fits into a ‘bowl’ in the end of the lower male-to-male connector to provide (hopefully!) a good seal. The end of my hosetail was a little scratched and pitted as you can see in the photo below, and there was still dirt attached to the inside of the ‘bowl’ even after cleaning. I therefore cleaned both with some fine wire wool to try and get both surfaces as smooth (and hence close-fitting) as possible. It’s important to do this carefully so that you don’t end up doing more scratching than polishing! When the finish on both parts looks reasonable, I used some brassware polishing powder (mildly abrasive) between the two surface and spun the hosetail between my fingers within the bowl of the connector, the same idea as grinding a valve seat I guess. This gave a reasonably good finish that I was happy enough to go with, fingers crossed! If you do the same, make sure you give the various bit a good wash after to wash away all traces of abrasive cleaner etc. To fit the new cork seal, first sit it on top of the main slider body so you can gauge how tight a fit it is going to be. If it just drops in without any pressure its probably too small, but you also don’t want it so over-sized so that it gets damaged as you push it in. The seals I bought pushed in snugly with a small amount of pressure from my thumb. Once pushed fully in so that they are touching the slider, I found that the top of the cork was about flush with the top of the slider body, covering all of the internal thread (as shown in the photo below). This is obviously a problem when you come to screw in the connectors. However, you should be able to gently work your way around the edge of the cork with your thumbnail, gently pressing this down into the body of the valve such that the first thread or so becomes visible. Once the first cork is in place, repeat on the other side of the valve. Some people have suggested that it is best to soak the new corks overnight in petrol, or in warm water for a couple of hours prior to fitting in order for them to swell up and soften. I decided not to take this approach as the corks I had seemed a reasonably tight fit into the main body anyway, so any swelling would probably mean damaging them as they were pushed in. Also, I think it better for the corks to swell in situ so they can take up the shape of the thread and slider. Instead I soaked them in petrol after they were assembled into the taps – see Step 8 below. Once both corks are installed it is time to fit the male-to-male connectors. Sit one onto the top of the slider assembly on top of the cork seal (make sure you get the right one for the top or bottom!) and gently push down and rotate. The ridges on the inside of the connector which help form the seal will start to indent rings into the cork and you should be able to get the thread to start. It could be very easy to cross the thread at this stage though (especially if the cork is a little on the thicker side) so go slowly and gently at first. Once the thread has started, you can carefully nip the connector up with a spanner, although not fully tight at this stage. You may want to then undo the connector to satisfy yourself that the cork has seated nicely inside, before nipping it back up again. When the first male-to-male connector is on, repeat the same process for the other one. Double check that you have got them the correct way round in relation to the text stamped onto the on-off knobs. The connector that screws into the tank obviously needs to go at the top, the one onto which the hosetail fits at the bottom. If all has gone to plan, the on-off slider should now be quite stiff, but you should just about be able to move it back and forth. It will free up with use or you could try dripping a few drops of light oil down inside which should help lubricate it. Looking down through the valve you should see the hole open up and close as you do so. If not, something is very wrong! 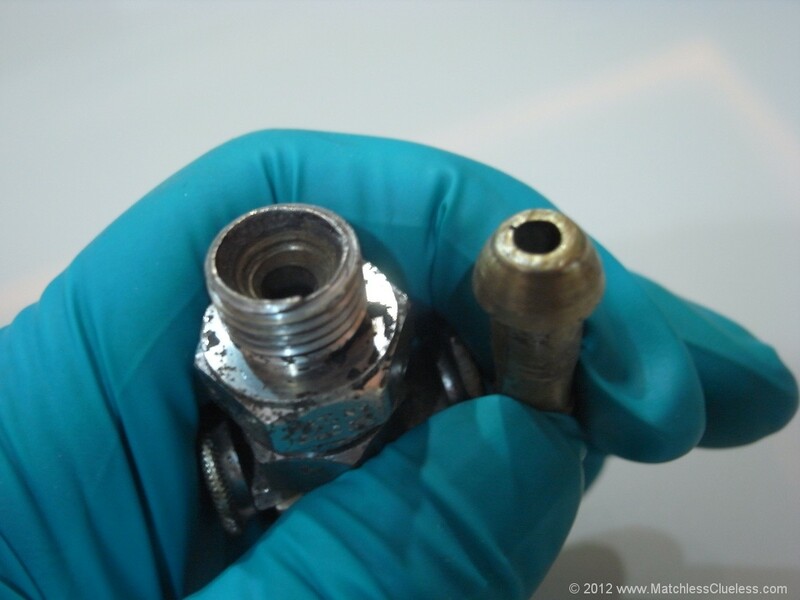 Lastly, refit the hosetail connector and gently tighten up the securing nut. This needs to be reasonably tight in order to give a good seal between the hosetail and the lower male-to-male connector, but a word of warning! I found out the hard way that these old fittings aren’t the strongest. I remember thinking make sure you don’t do it too tight, just one last little nip up, but then ‘ping’ and a crack had appeared in the side of the nut. Nothing to disastrous as it still seems to hold a good seal (at least for know), but it does show how fragile some of the parts are. You’ve been warned! I decided to soak the first tap I rebuilt only after it was fully reassembled with the new corks inside. My logic was that it is best for the corks to swell in situ so they take up the shape inside the slider body, rather than just swell all over if they were by themselves in a jar. With the taps reassembled, I loosened the male-to-male connectors on each side of the slider body off slightly to give the corks some room to swell. I think then left the whole tap submerged in a jar of petrol overnight before refitting to the bike. That said, I was in more of a rush to fit the second petrol tap I serviced the next day so I only let it soak for about 1/2 hour in petrol before installing it back in the tank. And of course it turned out that this one sealed better than the one that soaked overnight, so it seems that there’s as much luck as skill involved in the art of fixing petrol tap leaks! With the corks well soaked (and hopefully reasonably well swollen inside the valves) it’s time for the moment of truth when you refit them to the tank and see how much petrol pours out! Tighten up the various connections in the tap assembly then carefully screw this back into the base of the petrol tank, taking care not to cross the threads. There should be a fibre washer in place between the tap assembly and the tank to provide the seal at this connection. I also put a few loops of PTFE tape around the thread as a precaution, although this has probably already dissolved in the petrol. It did help the thread tighten up quite nicely though. Getting the taps to end up in the right place so that the on-off knobs are in the desired location is down to trial and error. My first tap went in perfect first time with the slider aligned with the length of the bike, but the second one I just couldn’t get right. In the end, I settled for the slider being aligned across the bike, but this tap was the reserve and I thought it would at least help me to remember which one was which! If you can’t get them to tighten up to just the right position, try adding an extra fibre washer between the tap and the tank. The extra 1/4 turn on the tap to get it in just the right position is always hard to resist, but then it’s always that last 1/4 turn that strips the thread or snaps the bolt off too! Once both taps are in place, its time to fill the tank back up with petrol and see what happens. 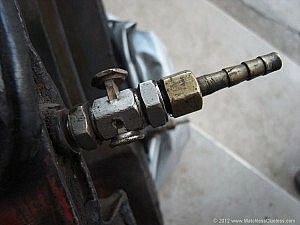 Start with just a little petrol in case you have a bad leak and need to re-drain it to re-check a joint. If all seems well, try a little more petrol and then leave it for half an hour or so. Petrol has a knack for finding it’s way through the smallest of gaps, but it may take a few minutes to first appear. If there is a still a small amount of leakage from around the new corks (either the tap still drips slightly when in the off position or some petrol seeps out around the slider), then don’t despair. This will hopefully stop in the next few hours / days as the cork washers continue to swell inside and the seal gets better. Turn the taps on and off every now and then and keep a close eye on them for a few days. Better still, go for a ride – it will also help evaporate any petrol which is still seeping out rather than it stinking out your garage or shed! In my case, one tap already had a near perfect seal and the other one gave an occasional drip out of the bottom. A small amount of petrol was also seeping around the fibre washer where it fits into the tank, but an extra tweak with a spanner soon solved that. It is important that the new cork washers that you’ve fitted don’t dry out too much, otherwise they will shrink and you might find the taps start leaking again. If the bike is used regularly and the tank kept full then you should have no problems. But if the bike is not used for extended periods (for example over a winter layup), it’s worth keeping at least a small amount of petrol in the tank and turning the taps on and off every few days to make sure everything stays moist. 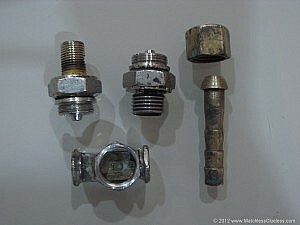 So there you have it, my guide to fixing a leaking petrol tap by replacing the internal cork washers. Hopefully you found it useful. If you have any comments or suggestions, then please leave me a message at the bottom of the page. Very useful advice. One point not mentioned is that none of my Imperial BSW/BSF spanners/sockets fit any parts of the taps on my old Norton Big 4. I find myself using metric spanners like 16mm. Perhaps the taps were made using AF/UNF/UNC hexagons? My bike dates from 1947 ie immediately post war when American threads and spanners became more plentiful in Blighty. Good point regarding the spanners. This was before I even bought a set of Whitworth spanners so I was relying on a combination of metric and imperial sets to find something that fitted. Like you say, this wasn’t easy or ideal though! I do seem to remember a spark plug socket coming in rather useful for dismantling the petrol taps as the extra depth allowed it to go right on and provide a more secure grip that the spanners. I’m really pleased to see how your website is growing and using your guide I’ve just recorked the push/pull Hexagon taps on my 1947 Norton “Big 4” 633cc side valve single. I love this bike. James Landsdowne Norton himself designed the engine in 1907. While the Big 4 (properly called the Model 1) continued into the 1950’s, 1947 was the last year of true original long stroker. 120mm stroke and 82 mm bore. Massive flywheels and incredible torque. These engines were even fitted to several makes of light tractor. The information provided on your site is always presented in such a simple and logical way so would it be worth stating the obvious for dolts like me? PS I find a tiny smear of grease on the corks in petrol taps stops the corks shredding on reassembly. Thanks John – a useful tip with regards to the smear of grease. Will remember that for the next time! A very useful article and very clearly explained.Thank you for posting it. Excellent.I stumbled on to the site when I was looking to buy a new tap for my very vintage (1930s) 1 1/2 HP Stuart Turner tank, and despairing that I would ever find a match. I will repair it now following reading this. Nice one James. It’s always worth having a go with old taps because new ones are pretty expensive. I fitted new corks to my M18 Norton taps a couple of years or maybe more ago though they were too thick initially and I had to carve them up a bit. Since the beginning of May the old Nozzer’s been stood up – the CCM’s been nearest to the door – so I went to it today, poured in some fuel and lo and behold, both taps leaking big style. I’ve drained the juice and will have another look tomorrow to see if the fuel’s made them swell again, otherwise it’s new corks again. Cheers Nigel – good luck with your corks! I’m restoring a lambretta li 150 series 2,i need to replace the rubber seal in the petrol tap it’s 20mm dia witth four holes exactly the same for Yamaha bikes only smaller,where can I get a seal,tried every where. I make my own washers , using basic tools . Power drill . 5mm drill bit . sand or wet/dry paper . hacksaw . bolt about 5mm dia . 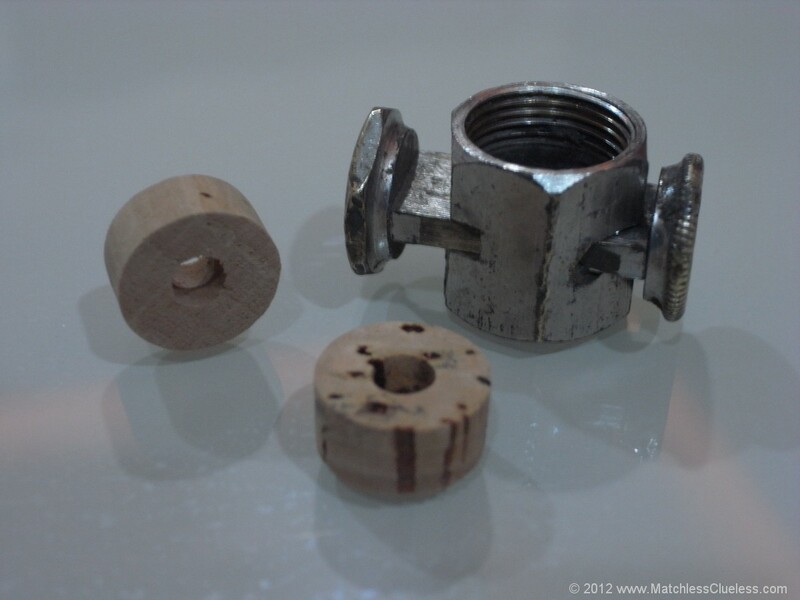 nut & washers . Making 5 or 6 washers is easy and takes about 10 minutes . Drill down centre of the cork 5mm ( doesn’t have to be exact centre , but needs to be fairly close ) . Mount this in the power drill . Wrap sand/wet/dry paper round a flat bar . run drill and use hacksaw to cut corks to 1/4″ length . Great stuff – thanks for posting the link to this article into the AJSMOC forum! I’m awaiting delivery of some cork washers but at 1/4″ thickness I’m concerned they may be too big. Your words James have made me feel more confident that they will be okay, (they are for a vintage Stuart turner fuel tank). I might give Bob’s idea of making some out of bottle corks a try too. A lot of good useful tips here. Thanks a lot. I’ve just finished a really nice Bardolino , good quaffing wine and a nice smooth textured cork . Not one of those pesky plasticky things or even screw top . That’ll give me another supply of corks . and a good nights sleep !!! There is a picture of a push-on push-off type petrol tap as fitted to my G3Ls at the top of the page, “Fixing leaking petrol taps.” but I am unable to copy and paste it to this message. Is it possible to purchase such a petrol tap inclusive of all of the cork and other washers? vmcc shop sells these new.nb.washers here in uk are £1 each.been making my own for years now. Thanks for great article. I fought a fuel tap down to a slow drip about fifty years ago and have not tried a rebuild since. Until now. The previous owner of my ’51 AJS twin installed nice, new, chromed taps (looked like after-market mchdse) that had rubber washers inside, not cork. One worked fair, the other worked for one shutoff. I found that if you have new taps, you had better take them apart and dress the edges of the hole in the slider. The makers had left drill burrs that had notched the washers slicker than pond scum! All it takes is to knock down the edges of the slider hole with about a 1/4 drill bit hand held, takes about 15 seconds after you have it apart. Hello James , Thank you so much for the usefull article about taps and the cork washers , after almost 30 years i found what the washers were originally made , i have a Royal Enfield Clipper fromm the 56 , gift from my father when i was 14 im 50 now, we found the bike in a junk yard and restore completelly during those days , fortunatelly now with the net i found many spares , manuals ,and friendly people like who shares their experiense , im from Argentina and love old British bikes.